THESE SAFETY REGULATIONS MUST BE FOLLOWED TO PREVENT THE DISQUALIFICATION OF THE PULLER AND/OR HIS CREW MEMBERS. 1. Loss of any ballast weight or if the weight touches the ground, while the sled is in forward motion, the puller will be disqualified. If the ballast weight touches the track because of mechanical breakage, or if the loss of the ballast weight occurs after the track official has flagged the pull, there is no disqualification. 2. Disqualification if there is a loss of safety equipment and failure of safety equipment to function. 3. The excessive loss of liquid onto the track surface before the red flag; will be determined by the track official for disqualification. 4. 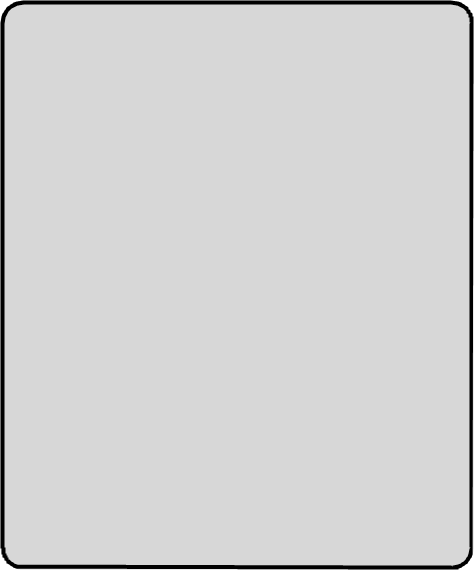 Illegal fuel (nitro-methane, nitrous oxide, or other oxygen carriers or combustion accelerators) unless the class rules allow. 5. Out of bounds with the pulling vehicle. 6. 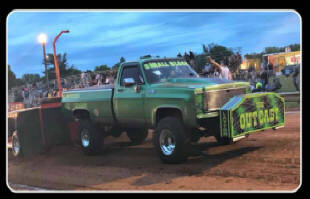 The unsafe operation of hot rodding of a pulling vehicle on the track and/or pit area will be cause for disqualification from the entire pull. 7. The puller will be disqualified if he leaves the starting line under the red flag. The pull will be considered over when forward motion of the load stops. The puller must stop immediately upon the signal from the track official. 9. Puller must pull within three (3) minutes from the time the sled is ready. 10. All vehicles must be in neutral while being hooked or unhooked from the sled, and foot or hand off the throttle. 11. All pulls must start with a tight hitch, no jerking permitted. 12. No portion of the vehicle may interfere with the sled during the pull. 13. All tractors must weigh within 500 pounds of the class being pulled.Will be left up to promoter's discretion. measurable hook, you are disqualified. Sled is officially set after the 3rd puller unless the promoter deems it necessary for safety reasons. 15. The puller is allowed to stop his vehicle before the sled reaches 75 feet on his first try; allowing him to make any necessary changes to the vehicle so he can immediately re-hook without being disqualified. If you have a mechanical problem on your first hook before you reach 75 feet, you can drop to last place for your second hook. In pull off the 75 foot rule does not apply. 16. 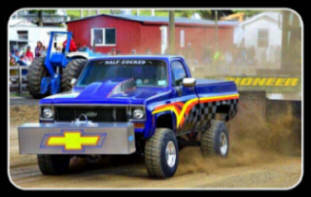 Only the driver is allowed on or in the vehicle when it is being driven or towed, while in the pulling track boundaries unless permitted by the promoter for safety reasons. 17. There will be 50 pounds given per class, for the pulling vehicle. This applies only if there are no movable weights or parts on the pulling vehicle that can be removed, that will make the vehicle operate in an unsafe manner. This rule does not apply due to the scales being off, because of mud, electronic failure, etc. The promoter will decide this. 18. Pullers must be signed in one (1) hour before the pull is started, unless traveling conditions, weather, or mechanical breakage of the hauling or towing vehicle occur. Each puller has to pull a random number and then it will be determined what order they will be pulling in each class. 20. 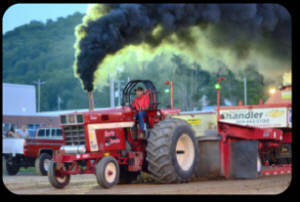 All tractor pullers must wear shirt, pants and shoes during their pull. No shorts, tank tops or sandals. 21. 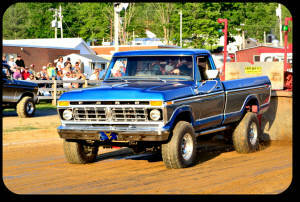 A pulling vehicle that does not meet class safety rules will not be allowed to pull, unless the promoter permits it. Any vehicle that does not meet class rules may be allowed to pull for exhibition only, no purse. 22. 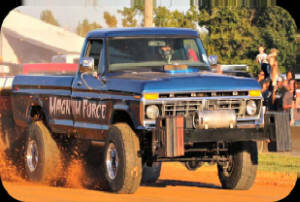 A pulling vehicle may be subject to inspection at any time during the pull by a tech official. 23. The promoter has the right to add or combine classes.